Geoffrey Pagen approaches clay with passion and adroit skill. His love of nature and drawing affects this ancient art form in a synergistically powerful and primal way. His contemporary aesthetic ties his work to the richly diverse and charged history of clay, from artifacts to building materials to civilization’s search for meaning. Pagen’s vast experience experimenting with glazing and raku allows him to deftly choreograph the chaos and control of his medium. 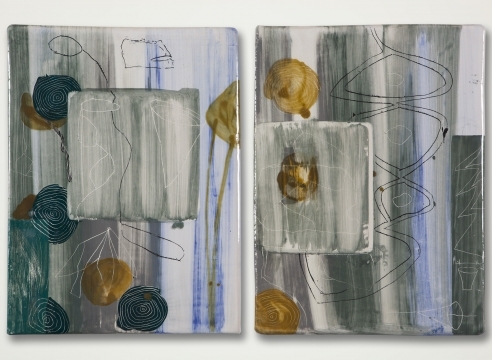 His active process combines cuneiforms, drawing, and geometric and organic forms with translucent, opaque, and iridescent glazing. The clay slabs develop into arousing single steles or modular elements of continuing and interlocking design, their power augmented by their scale. Originally trained as a potter, Pagen’s interests actually lie towards the physicality of clay rather than its functionality. Much of his work is meant to hang on the wall, although he also explores draping clay into freestanding basin forms. Pagen’s aesthetics and distinctive bravura reveal a modern urbanity that retains a primal sensibility, a combination that is striking, lusty and relevant.